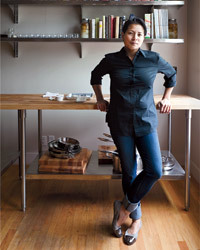 After graduating from San Francisco City College’s culinary program, Belinda Leong started her restaurant career at Restaurant Gary Danko on the savory team. She became enthralled by desserts while helping out an understaffed pastry department, and eventually rose to executive pastry chef. Nine years later, she took her passion for sweets abroad, interning with macaron master Pierre Hermé in Paris, and at Noma in Copenhagen. Leong landed back in California at David Kinch’s Manresa in 2011. He encouraged her to tease her own baked goods business through pop-up bake sales around San Francisco before she made it full-time. The first brick-and-mortar B. Patisserie opened in 2013. Here, Leong chats about her love of Breton pastries, cherished king cake trinkets and Pocky Sticks. Kouign amann, a specialty from Brittany, France, that’s like a cross between a palmier and croissant. I first learned to make it during a stage at Fauchon in New York. The dough is laminated with butter and sugar and it’s not easy to work with. No one else was making it and that really attracted me to it. Claudia Fleming’s The Last Course—my go-to book when I first became a pastry chef. I especially love her coconut tapioca with passion fruit and cilantro. What’s a dessert that tells your story as a pastry chef? Greek yogurt panna cotta with citrus cream. It’s creamy, tart and crunchy. I believe in combining different textures, and I learned a lot about that while working at Pierre Hermé. There’s a small piece of jaconde in the dessert—similar to an almond sponge cake—along with segments of grapefruit and orange, and a granola made with purple wheat, almonds and rice puffs. Gary Danko. I learned discipline from him and how to organize a kitchen. His flavors are so classic and solid—he makes what everybody wants to eat. What is one pastry technique that everyone should know? Making a mousse. It teaches you a few important skills: how to make a meringue, how to whip cream, how to fold ingredients together. And you can do so much with it; you can use mousse to make a cake or serve it in a scoop on its own. Passion fruit. I love the acidity and the bright, beautiful color. It adds a tanginess and a tropical feel; the tartness really brightens up chocolate and it works well in a macaron. Portland, Oregon. There are so many amazing food trends coming out of that city. I love funky, urban spots like Pok Pok and Pine State Biscuits. A little fève from Pierre Hermé. During January, we would make the galettes des rois (king cakes) and there would always be a little ornament, or fève, baked inside. It was my dream to go to Pierre Hermé, and the fève reminds me that I was there. Vietnamese pho, it’s so warm and comforting. There’s this hole-in-the-wall in San Francisco called Turtle Tower and I eat there probably three times a week. Strawberry Pocky Sticks. It’s a childhood thing and they are so simple to snack on. I draw a lot. I sketch all of my desserts, each component. I have pages and pages of this stuff. A friend of mine took some of my drawings and made a digital decal with them to put on the walls at B. Patisserie.